After explaining the game to people over Discord and explaining a bunch of stuff to my local players, I thought it would make life easier if I made an instructional series on the game mechanics. Here is it. Let me know if I need to correct anything. I do not go back to work until Monday, so I have some time to make last minute corrections if need be. Also, a big thank you to all of you guys on this forum who helped me learn the game. You know who are. Cool... I'll check them out over the weekend. I just watched the Character Creation video... I disagree that using the Module system "takes all day", or requires you to read 40+ pages (skim, sure, but not necessarily read). The module system also allows you to have more negative traits, as ones acquired via modules and optimization don't count against the 10% maximum of "bought" XP. Aging effects and the benefits of formal schooling (Skill Fields) were also missed in your explanation. That said, using modules does require a lot of book keeping, and that's why I (and others here) have built spreadsheets to help with that. - Connections are essentially useless without Protocol, Streetwise, or Negotiation (depending on the kind of contacts they are). All three rely on CHA, so if Connections are something you want, CHA isn't something to "min". - Your comment implying a specific tonnage implication for the number of Trait Points in Vehicle, while a common interpretation, is not supported by the rules as written. Thank you for the feedback. The life-module system does take me all day to do the book keeping; thanks for letting me know that this may only be particular to me. Also, I intentionally left the aging affects and school fields out to keep the video simpler. However, you may be right that they should be explained. I will set the character creation video to private and work on making a new one. The new character creation video will give a fairer interpretation of the life module system and will explain the skill fields and aging. Your feedback on the Connections Trait is also noted. When I help people create characters, I usually try to get them to give me an idea of the kind of character they're looking for. That vastly simplifies the decision making surrounding which modules to take. For a (much) more detailed example, I might recommend looking over this thread by Takiro. A lot of it is unit stuff, but the characters are all very interesting. My approach in that thread was to start with an idea, then flesh it out via the life module process. Thanks for doing this, by the way. I do think explainers will help the community grow. The new video on character creation is up. I added in the skill field system and aging effects. While I do go back to work tomorrow as a university writing consultant, I can find the time to remake any videos that need to be improved upon. Cool... I've got a few things to do this afternoon, but will take a look this evening... thanks! You character is a Hot Shot Mechwarrior...but he's mute(no Language skill). I know you are not a fan of the Life Paths, but could do a run of the Life Paths before you do Equipment Purchasing? Oh crap I forgot the language skill. Right, I need to go over the minimum requirements. You know how people forget sometimes? It happened to me. Don't worry, I will edit in a section on the minimum requirements and give Hot-shot Mechmac a language skill. I will also go over how the language skill works. It will be the same video, just with a couple of edited in sections. I just got home, and have a few threads to wade through before I can look in here... shouldn't be too long (I hope). Yep, I set the video to private because I forgot to give the character a language skill in English. I am never publishing a video on the same day I make it again. Had I waited a day, that oversight would have been found. Anyway, here is the same video but with a section on the minimum skill requirements and a section giving Hot-shot Mechmac the Language/English skill. I didn't talk about the minimum attribute requirement nor the max attribute requirement (based on phenotype), but those are mentioned in the video description. I will talk about phenotype in a future video, and the minimum attribute requirement should be discussed in an earlier video. One point to make about attributes is that they're MUCH cheaper to buy up at creation than later on. That's not so much the case with skills. Wow, I always wondered about whether or not the link transferred to TW with the Gunnery and Piloting skills. I may have to make a video over the Tactical Combat Addendum--or something--and go over that. I just checked AToW, and I'm honestly not sure if you can take Skill Fields with Point Buy. The description of Skill Fields is under Stage 3, and nowhere else. It doesn't seem to be banned, so I suppose it depends on how you choose to read it. Might be worth a Rules Question, though the AToW board usually takes a while to get answers. Page 89 says that you can use the skill fields under the point buy-system. It is in the very lower right hand corner. However, a point-buy character is limited to choosing up to three skill fields. Cool... missed that bit (sorry, I don't use Point Buy at all, so I'm less familiar with it). Aside from other comments, I think that was a good overview of the Point Buy system, though you might want to point out that page 89 reference since it's so easy to miss. I put a comment about page 89 in the video description. Yes, I will do a video on the life module system. It may take me a bit. I don't want to rush this is and have to do it over again because of a careless mistake. You're very welcome! I was probably typing when you mentioned page 89, so I'll be more careful next time. I look forward to your Life Module video... just let me know when it's up! I was under the impression that it was optional. Will have to check the book when I get off work. As noted in the sidebar A Time of War vs. Total Warfare (see p. 40), character Skills in A Time of War convert easily and directly into Total Warfare Skill ratings by simply subtracting the character’s relevant A Time of War Skill level from the Skill’s TN. 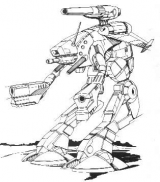 For example, an Inner Sphere MechWarrior character with a Gunnery/’Mech Skill level of +4 would subtract that number from the Skill’s TN of 8 to receive a Total Warfare Gunnery Skill of 4 (8 – 4 = 4). players will instead continue to resolve actions using the rules presented in this book. Thus, instead of converting Skills from A Time of War to Total Warfare, the players should instead convert from Total Warfare to A Time of War. They may do so simply by subtracting the relevant Total Warfare Skill from the TN of its appropriate A Time of War Skill equivalent. Hope it's okay to copy this directly, not sure of the full rules yet. I pulled it from page 201 of A Time of War, 2010 printing. The RPG prefers to stick to the values presented in it. The book simply says "simply subtract the character's skill level from the skill's Base Target number as listed in the book." No mention at all of the linked attributes, and also no mention of the fact that the Clan's Phenotype Field Aptitude modifies the actual target number. I assume that the Field Aptitude modifier applies, but the link doesn't necessarily. Of course, it depends on how detailed you want the Total Warfare game to be. If you just want a quick conversion than the book is pretty simple. If you're using a fully detailed record sheet then you may want to apply everything. Well considering Attributes and Phenotype Field Aptitude are a part of the end skill level, I would include them.